When I think of donuts, I think of my childhood… those special occasional weekends when my parents decided to surprise us with store-bought donuts for breakfast. My favorite two donuts were powdered cake and chocolate cake with chocolate glaze and shredded coconut. Unfortunately, knowing what I know now, I can’t help but think of how unhealthy they were… fried and filled with a lot of refined sugar. They have now become more of a dessert in my mind, and I just simply can’t enjoy the store-bought ones for breakfast. Of course, I still go by my motto of ‘everything is ok in moderation’, especially when on vacation, and I just can’t pass up the occasional vegan donut find (I’m referring to the amazing vegan donuts they have over at Blue Star Donuts in Portland); but why not take ‘occasional’ out of the picture and be able to enjoy donuts on more of a regular basis. Not to mention, vegan donuts aren’t easy to find where I live. Hence the desire to come up with a healthier vegan recipe to enjoy at home. 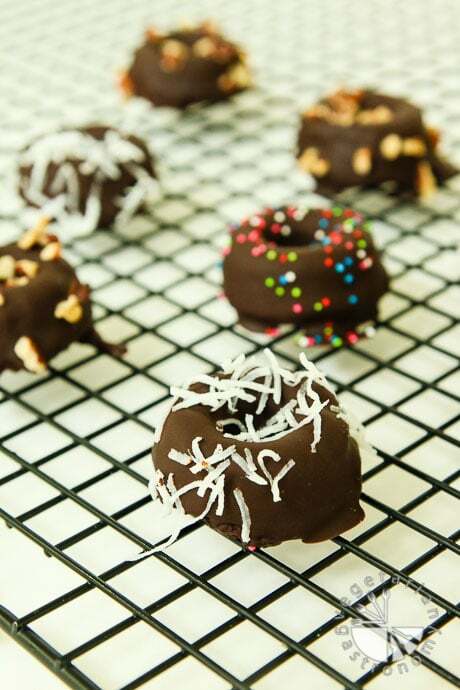 And with that, I present to you today’s recipe…Double Chocolate Chia Cake Donuts! 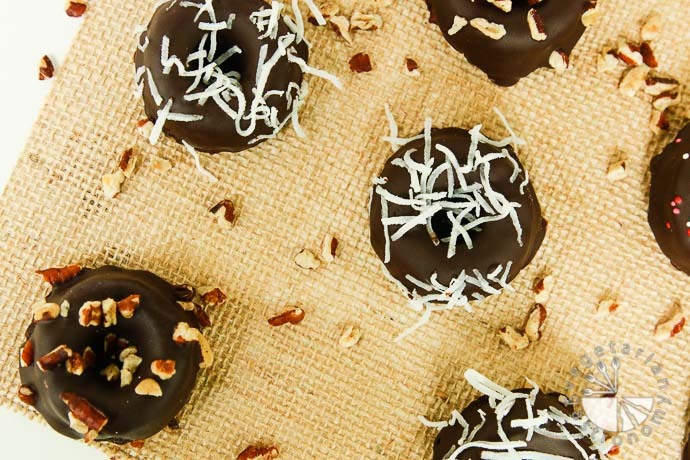 These mini donuts are vegan, gluten-free, healthier, and dangerously addicting! They are inspired by a recipe I came across from In My Bowl, original recipe found here! I loved the idea and use of chia seeds combined with coconut milk (instead of almond milk) to make up most of the liquid base. So I decided to start from there play around with a few different ingredients I originally planned on using for these donuts. I love using oat flour if I can as the base for baked goods, especially after using it for my Blueberry Banana Breakfast Cookies, which were a huge hit! Oat flour is not only healthier than other traditional flours, but it also goes along with ‘donuts for breakfast’ since my kid’s typical breakfast consists of oatmeal containing almond meal and sweetened with fruit. Which comes to my next ingredient…almond meal. My daughter loves raw nuts, but my son on the other hand, doesn’t care for them in the raw form. So I’m always trying to sneak them in whenever I can. The use of ground oats and some almond meal as the base, also makes them gluten-free (which was perfect since my brother was visiting that coming weekend). The donuts themselves are free of refined sugar and get their sweetness from the use of bananas and some pure maple syrup with a hint of vanilla, which as you may know, are currently two of my favorite sweeteners of choice. I knew I wanted to coat these donuts with a simple chocolate sauce, so I minimized the sweetness of the actual donuts themselves. In other words, these donuts are meant to be enjoyed with the chocolate sauce coating. I encourage you to try them without it, but you may find them to be a bit under-sweetened. It took me four tries to perfect the ratios of ingredients (although my kids enjoyed each trial). Since these donuts are baked, instead of fried, they are naturally more cake-like in texture…hence the name ‘cake’ donuts. The chia seeds added an element of texture, which we loved, especially since we are huge fans of chia pudding. I created a pretty basic chocolate sauce made with vegan dark chocolate chips and some coconut oil to coat the donuts in after they cooled. The kids loved sprinkling different toppings on the donuts. They chose shredded coconut, pecans, and sprinkles. We placed them in the fridge for a short time to solidify the outer chocolate coating. I’m hoping to create a few different flavors and types of donuts in the near future, so stay tuned! In the meantime, try out this recipe and let me know what you think in the comments below! If you haven’t noticed already, starting with this post, I will now be leaving the ‘vegan’ and ‘gluten-free’ tags out of the Post Title and Recipe Name. I am now VEGAN as of a few months ago (read more about it here on my ABOUT page), hence all the recipes have been vegan on my site since my change in diet. The ‘Gluten-Free’ designation will now be stated in the NOTES section of the actual recipe below. 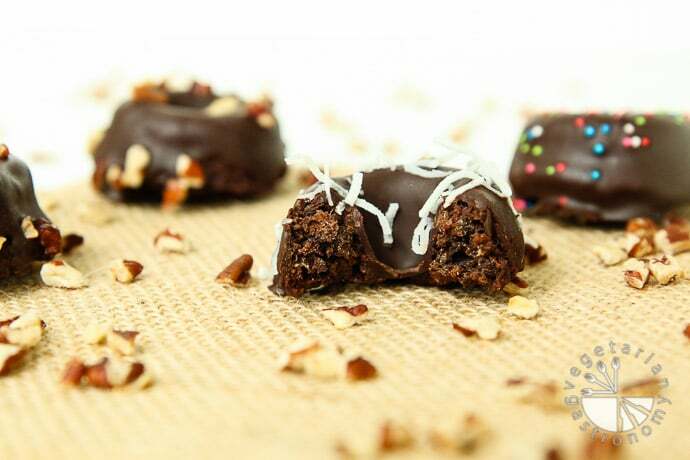 Indulge in these delicious mini chocolate cake donuts! They're vegan, healthy, gluten-free, refined sugar free, and the perfect breakfast, snack, or dessert! In a small bowl, combine the coconut milk, chia seeds, and apple cider vinegar. Whisk and set aside. Combine the ground oats, almond meal, cocoa powder, baking powder, baking soda, cinnamon, and salt. Add the mashed bananas, coconut oil, maple syrup, vanilla extract, and the chia/coconut milk/apple cider vinegar mixture. Carefully combine everything together with a spoon or spatula. Do not over mix. Lightly grease a mini donut pan with coconut oil spray. Using a small spoon, carefully scoop the donut batter and fill into each mini donut section. Bake in the oven for ~25 minutes. Remove and allow them to cool completely in the pan (note: they will continue to cook while cooling in the pan). Once the donuts are completely cooled, turn the pan upside down and lightly tap on the counter to release the baked donuts. Prepare a double broiler to melt the chocolate. Add 1/2 cup dark chocolate chips and coconut oil. Mix with a spoon until all the chocolate chips are completely melted. Remove the top bowl from the heat, add in the remaining 1/4 cup chocolate chips and keep mixing with a spoon until all the chocolate chips are completely melted (they should all melt on their own, but if needed, feel free to place back on the heat for a short time to melt). 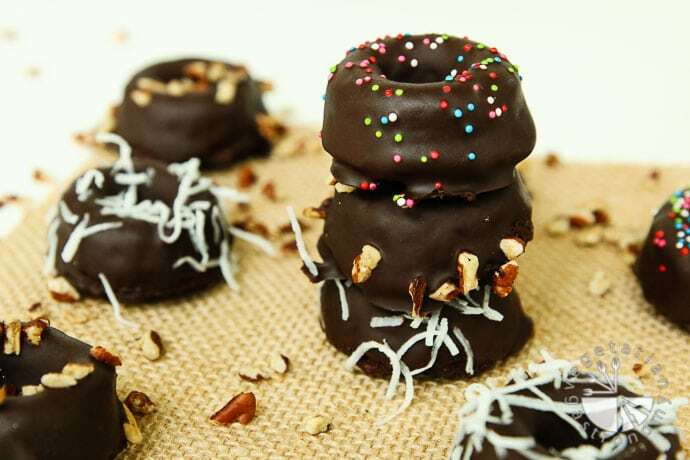 Holding the bottom flatter side of the donut, dip the top of the donut all the way down into the melted chocolate and then place on the baking sheet lined with parchment paper (chocolate coating side up). 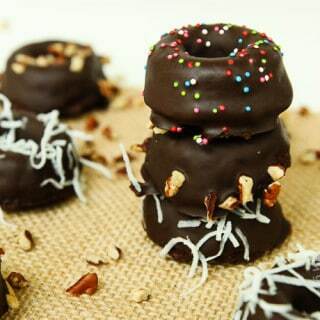 Repeat this for all the donuts so that each is coated with melted chocolate. Try to work quickly while coating the donuts. If using, sprinkle the top of the donuts with toppings of choice. 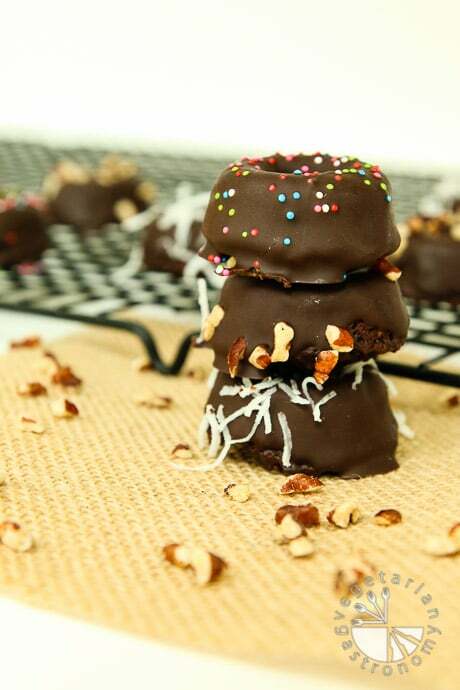 Place in the fridge until the outer chocolate coating has solidified. Store in the fridge. Enjoy cold! Ground Oats - To make ground oats, add rolled oats to a food processor and process for 3-4 minutes until very fine. Make-Ahead Tip - I typically make ground oats in large batches and store in the fridge for use when needed. « Tasty Recipes To Celebrate National Garlic Day! They look delicious. Instead of 8-9 pics, it would be great to get the nutritional information. Thank you. The number of pictures I post for each recipe has no correlation to whether or not I post the nutritional information.Nutritional information is a recent addition, and I'm still going back and forth on whether I want to provide this since I am not a nutritional expert or specialist and the information can vary based on what brand of ingredients you use, any variations made to actual amounts of ingredients, and any modifications/substitutions made to the original recipe. I also only have access to a free site, and cannot verify the nutritional information they provide for each ingredient.As a food blogger, I always take a series of pictures and take the time to style and photograph my recipes each time. I always edit around 5-10 pictures per recipe, and yes, for this recipe, I loved all the pictures I took and hence decided to post more. If I don't post the nutritional information when I post the recipe, I try to get to it when time permits based on my priorities. That being said, as I stated in my ABOUT page, if you would like nutritional information for a recipe, you can simply ask for it in the comments and I will do my best to get it up. Or the website I use to calculate it is available to the public on my ABOUT page and can be used by anyone. Thank you for following, and hope you get the chance to try out this recipe, they are truly delicious! I disagree with Jem. Your pictures are always beautiful and thank you for taking the time to photograph and post the pics. In my opinion, pictures are what make the blogs special and real. And let’s not forget, it is your blog and you can do whatever you like to do! Loved this recipe! I made alternatives and it stilled turned out amazing. I would love to give you a shoutout and feature your recipe with alternatives on my blog! Thank you so much for trying out this recipe and tagging me on IG! I love seeing pictures of my recipes re-created! So glad you enjoyed the recipe, and loved your alternatives! Thanks again for the comment and sharing on IG! yumm, these look amazing! 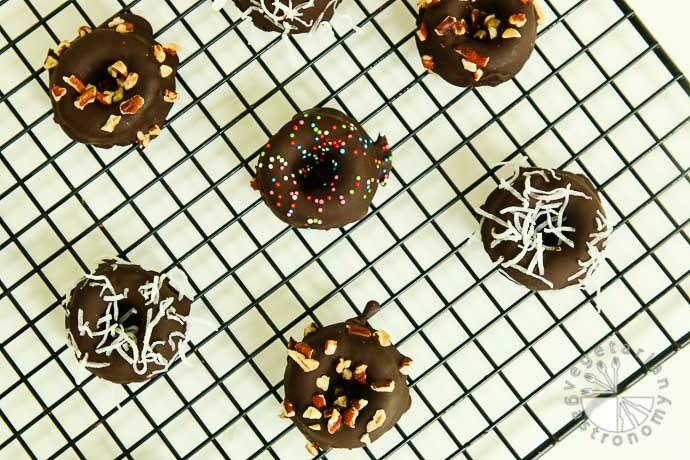 i don't have a donut pan, although i may have to get one just for this recipe! thoughts on making them as mini muffins or regular muffins? cook time? thanks! Hi Ami! Yes, absolutely. I actually in fact made these in a mini muffin pan. Simply use coconut oil to quickly spray the muffin tin and fill them as you normally would. They taste just as great, just more like muffins! I believe several others have also made this recipe using a regular size donut pan as well. Hope that helps! And let me know how you like them once you try out the recipe! Thanks so much! BTW...cook time is the same. Make sure you let them cool before removing from the pan so they finish cooking. Can't wait to try these. Is there a substitute for the almomd meal? We have nut allergies in our household. Yay!! So glad you loved them! I think I was the same way the first time around, wasn't quite sure, but then couldn't keep my hands on them and knew I was addicted =) And no refined sugar! Chia pudding is so delicious - you will love the chia pudding recipes I have up. Yes, they do not rise. I'll be sure to edit the recipe and indicate that they should be filled to the top. And yes, a banana puree would be absolutely fine, and definitely will get rid of those banana chunks if you're not able to mash them away with a fork depending on how ripe your bananas are. So excited you are using them for Rakhi! Let me know how they like them! Thank you...seriously made my day! Is there a substitute for oat flour? My daughter can't have oats, including GF oats. Thanks! For this particular recipe, I really wanted to focus on something healthy, so I chose oat flour to work with and did my trials and recipe development based on that. I have not personally tried any other flour, and all flours typically do work differently in baked goods and it's not necessarily always a 1:1 substitution. But since you asked, I'm totally curious to see if this would work with all-purpose flour or whole wheat flour or spelt. I've been meaning to make these again for my kids (they love them), so I will test them out using either all-purpose, whole wheat, or spelt and let you know. I may not get around to it for another 2 weeks, so if you decide to give it a go, let me know how they turn out! Otherwise I'll reply back to you after I've tried it out. Let me know if there is a particular flour you were thinking of using. Sounds great, thank you! Because of her gluten allergy, I was wondering how almond flour or coconut flour would work? It was very testy. My kids like it very much. Thanks.